Last year I wrote an article about being a lifelong learner. If you missed it, it would be worth reading. So stop reading now and click here to read it. Then come back and finish this article. As I ponder being a lifelong learner, I often wonder why it is difficult as an adult to learn new things. Is it because we get stuck in a rut of doing the same thing in the same way all the time? Is it because we are afraid to learn something new? Is it that we're afraid of failing at something when we get used to being successful in the things that we have practiced? Is it because we don't want to miss the new episode of Duck Dynasty? Whatever the reason, I hope that I never get stuck in such a rut that I cease to learn new things. 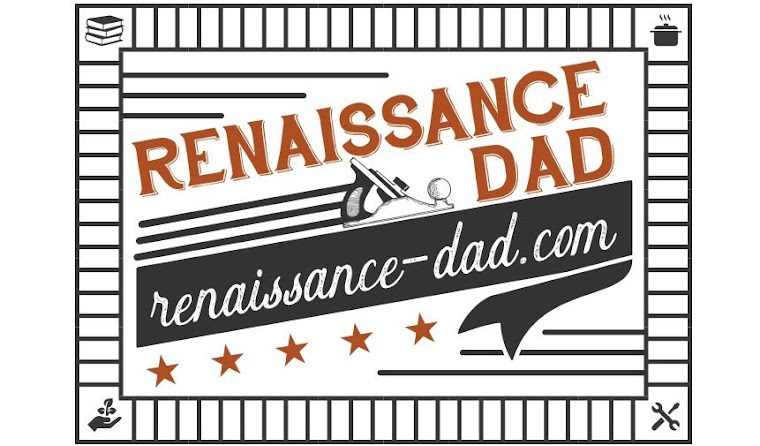 I think of my grandpa, a retired police detective, who over the years has taught himself leather working, metal detecting, photography, and to research genealogy. I want to be like that when I grow up. I want to be the type of person who continues to learn new things well into my 80's. So here is my story about the latest thing I have learned. 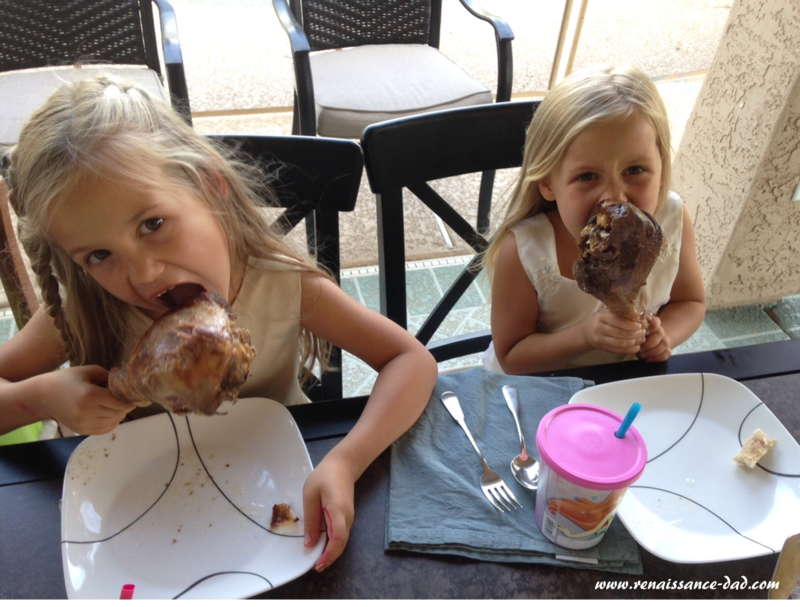 The girls like fresh turkey legs, "like a slobbering bulldog!" Last summer, when I learned to milk cows, my friends Sherri and Bob had some turkeys that they were raising for Thanksgiving. We ended up buying a turkey from them, and in the process I learned how to process a turkey. (In case you didn't know, apparently it is bad form to use the work "butcher" when talking about processing meat. Apparently it's too gruesome of a word. Unless you're a butcher. Then you can butcher away.) 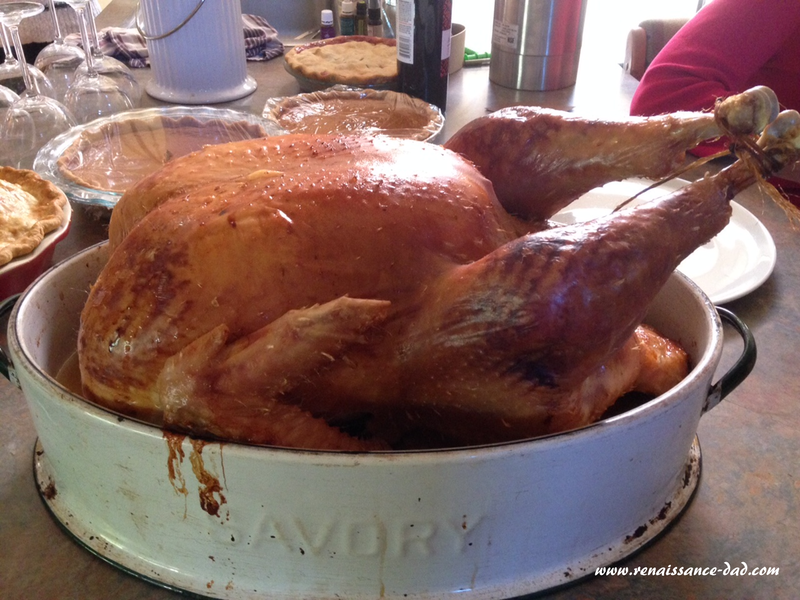 So we bought the turkey, my kids got to see it grow big and fat, and then in November I got to process the turkey. So our Thanksgiving bird (26 pounds) was about as fresh as they can get. Here's the interesting part: my kids were absolutely fascinated by the whole process. They were excited to hear how everything worked. They asked a lot of questions. And they understood the difference between a pet and something that is meant to be eaten. My interest and fascination with the process overflowed onto them, and they became interested. 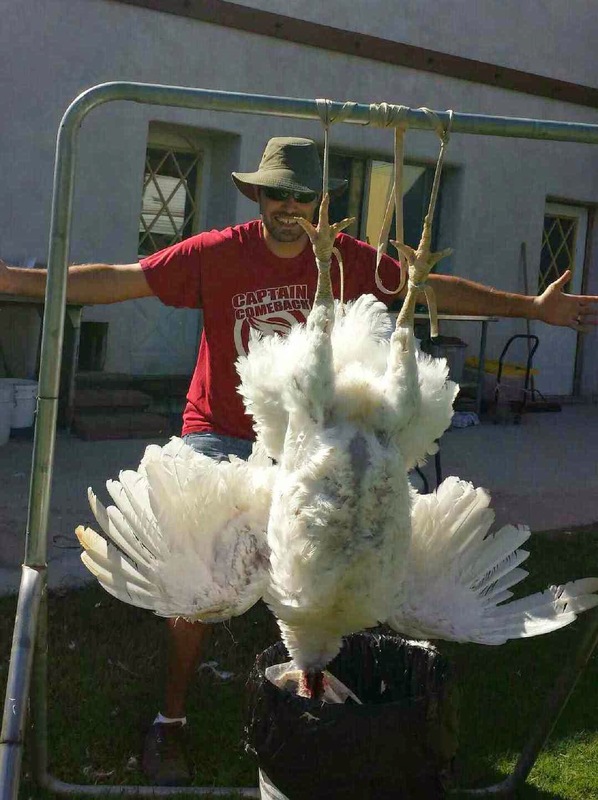 While I was processing the bird on a Sunday, Big E told her Sunday school teacher that I wasn't at church because I was cutting a turkey's head off (not exactly how it happened, but she didn't quite have the play-by-play). 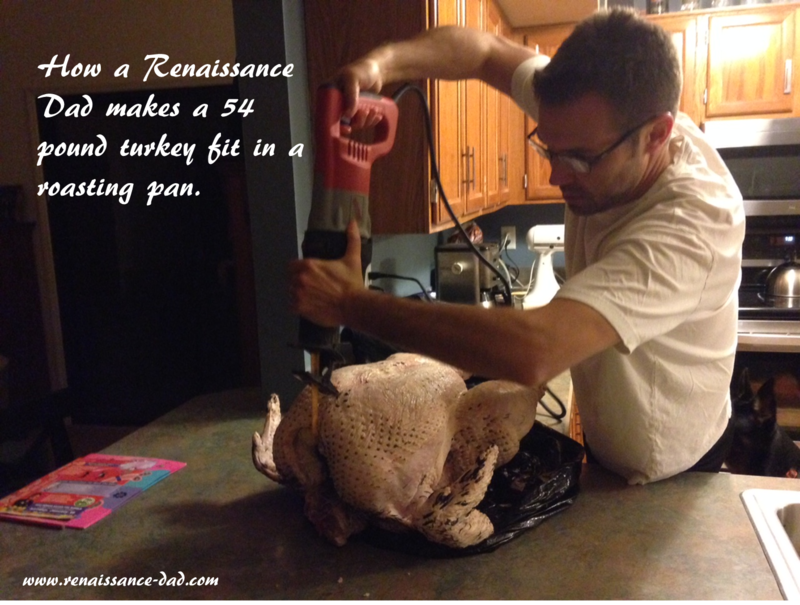 I have since processed a second turkey, this one weighing in at 54 pounds (all hormone free; this was just one fat bird)! I debated as to how many pictures to show in this article. I decided to forgo the pictures that might offend my more tender readers. However, it is a fascinating process of cutting the turkey's neck so it can bleed out, plucking the feathers, and then removing the insides. Participating in the process from start to finish made the Thanksgiving dinner that much more enjoyable. 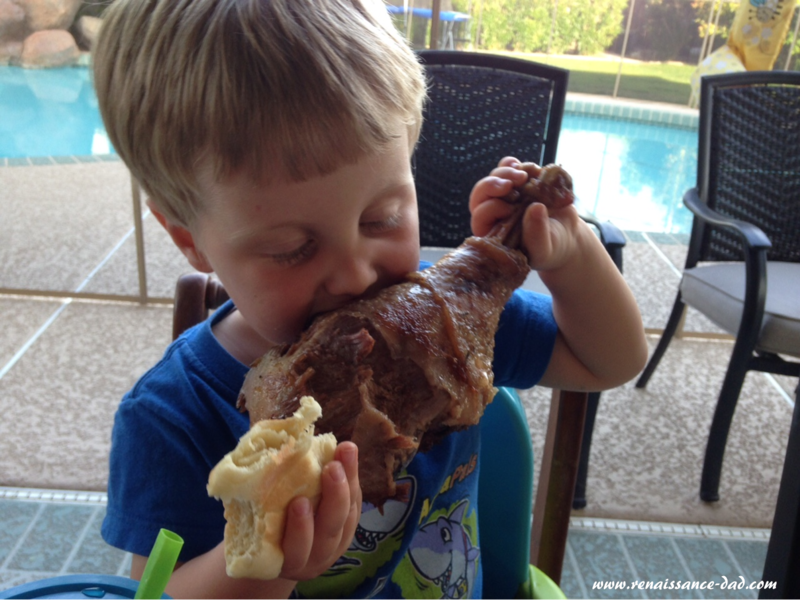 Watching my kids attack the turkey legs, knowing that their daddy provided the food for the table, made me realize that my journey in being a lifelong learner is what many people centuries ago did just to survive. And it was all worth it when Big E said, "I'm like a sweet little angel when I'm looking at turkey legs, but like a slobbering bulldog when I get to eat them!"